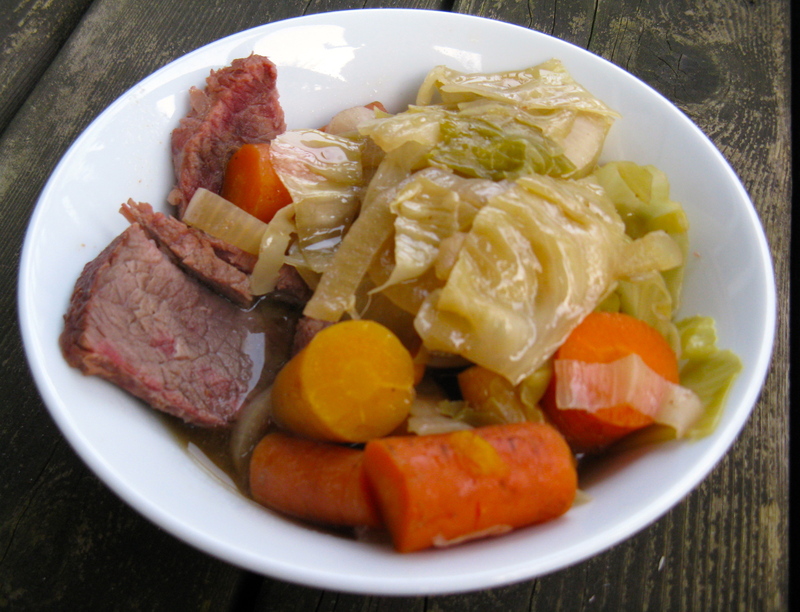 To celebrate St. Patrick’s Day, I made corned beef and cabbage, which was out-of-this-world amazing! I probably hadn’t eaten corned beef since I was somewhere between the ages of 12-15. I cheated a little and bought 2 lbs worth of fresh, local corned beef at Whole Foods. It was pre-brined and had spices rubbed all over it, and just needed to be cooked. I threw it in the slow cooker with carrots, yellow onion, green cabbage and bone broth, and let it cook for about 4.5 hours. It was perfect and much better than the corned beef I recall eating as a kid. The beef was more brown than pink after cooking, because it didn’t contain any nitrates, but it did have beet powder in the brine, which allowed for a tiny bit of pink. I served it up for us in bowls, to allow for ladel-fuls of savory broth. Check out how I made my corned beef and cabbage below. Place corned beef in the bottom of the slow cooker. Top with carrots, onion and finally cabbage. Pour broth over everything, making sure the meat is covered by about 1-inch. Put lid on slow cooker and cook on high for about 4.5 hours. Slice meat against the grain to serve. Top with veggies and lots of broth. Watch out for loose peppercorns from the rub! For a St. Patty’s Day treat, I whipped up the egg version of Against All Grain’s, cinnamon ‘oat’meal raisin cookies. Holy moly, these really do turn green too, especially as they sit and cool. The reaction of sunflower seed butter and baking soda causes the green to occur, in case you’re wondering. Mine turned just as green as Danielle’s (blogger of Against All Grain) did in her pictures! They almost look mossy and even look slightly blue, which may be in part from the raisins. Because of their mossy appearance, they’re definitely a Portland-appropriate cookie! We have a lot of moss here, because of rain and being in a valley. Speaking of this recipe, I had to chuckle when I read some of the comments. One of the readers, who clearly doesn’t pay attention or read Against All Grain’s posts very often, asked how much oats are needed for the recipe because it wasn’t mentioned in the ingredients. I loved Danielle’s response, telling her that it is a grain-free site and there are no oats in the recipe! The unsweetened coconut is meant to emulate the oats. Some people are so oblivious, yet I find it entertaining…sometimes. So, that was my St. Patrick’s Day. The rest of my weekend included (kind of) studying for finals, working on a final project, working at the gym, laundry and errands.